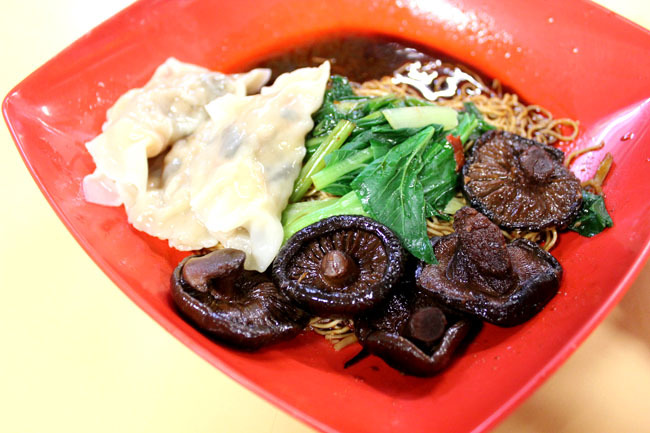 After watching the variety show “Just Noodles 面对面 by Kym Ng and Bryan Wong, I decided to make my way to find the cheapest and most delicious dumpling 水饺 noodles in Singapore. The programme features noodle stalls that sell the costliest or best value-for-money noodles, stalls with the longest historical background, most highly recommended stalls, etc. How many of you are actually fans of this programme? 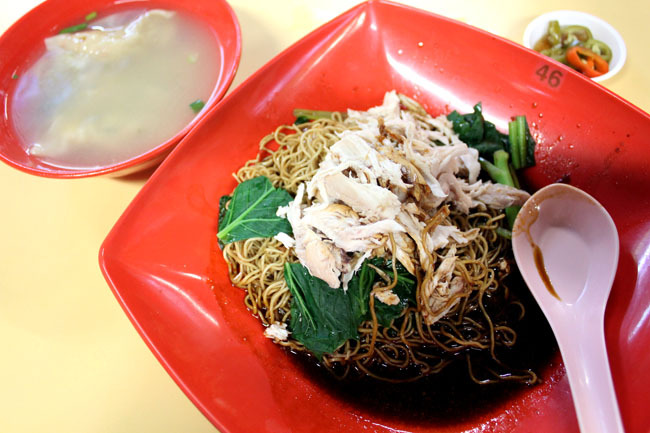 I have a secret to share – I am a closet fan of ‘Ms Tan’ Kym Ng, plus noodles definitely ranks top on my favourite hawker dish. 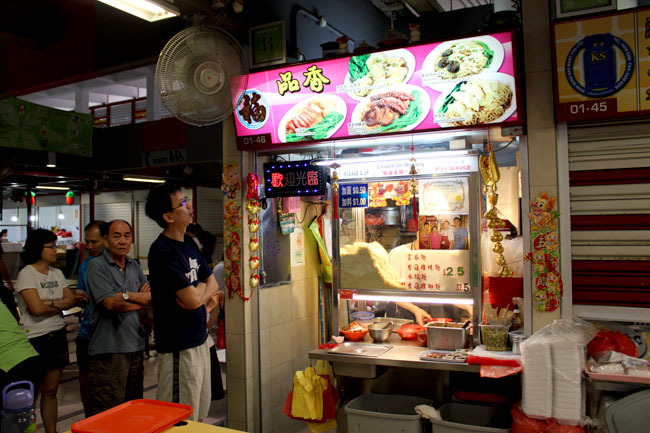 In the entire hawker centre at Toa Payoh Lor 4, it was not difficult to find the featured stall – “Pin Xiang 品香” which had the longest queue (about 10 people waiting at 7plus am). The stall owner was entertaining to watch, very friendly and animated, apologizing to loyal customers for the sudden long queue. The dumpling noodles ($2.50 alone, $1 to add chicken or mushrooms) does not disappoint! The QQ noodles is coated with the tasty dark soya sauce which is very KL-style, and marinated mushrooms (must have been marinated for days) is so awesome flavourful. 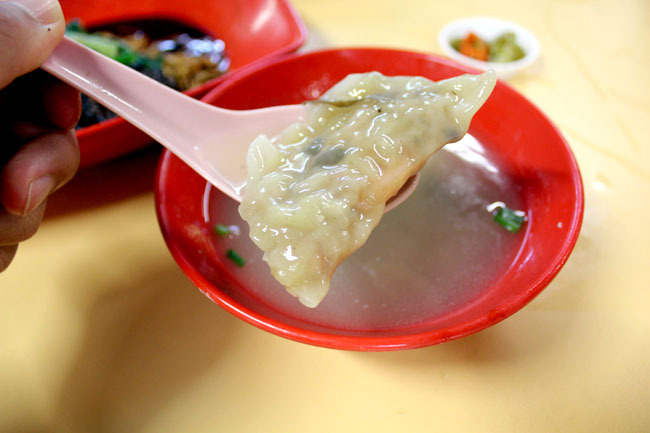 When you bite into the dumplings, you can see fresh shrimps and bits of water chestnut and carrots which add to the crunch. Most noodle soups are actually plain-tasting or full of MSG. Their version is cooked using anchovies and soya bean, adding sight sweetness. The drink stall auntie nearby didn’t look happy and said they must have paid for the television exposure. I do not know how much of this is true (Can anybody verify?) but this dumpling stall truly deserves to be featured.